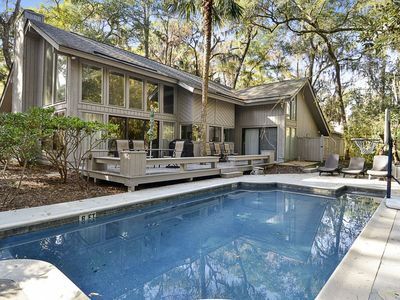 4 Bedroom / 4 bath home in Sea Pines in Hilton Head with a Private Pool, close to the beach! 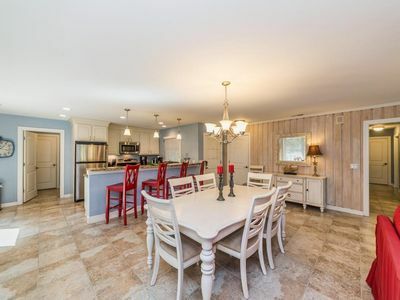 In 2015, this home underwent a complete remodel and has been professionally decorated. 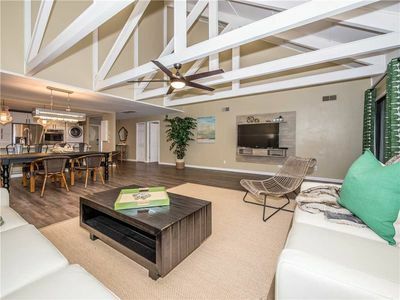 We hope you enjoy the wood paneled vaulted ceilings with custom tresses, along with the new kitchen and, custom quartzite island. 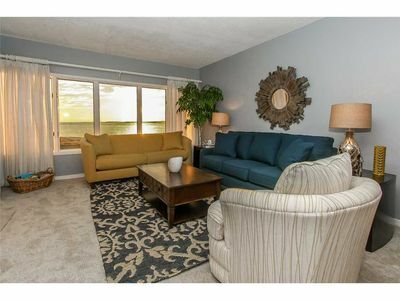 We have equipped this home with custom draperies and upholstered starfish couches and rattan chairs have been added to the living space. 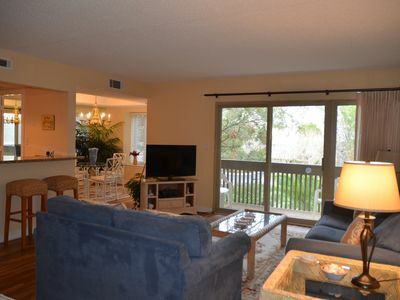 We hope you will enjoy the lookout loft area outfitted with its very own flat screen TV and more! Surprises throughout with fun wallpapers and vintage wall hangings! You will feel like you are sleeping on the beach in this master bedroom (#1), which has bedding done in Schumacher fabrics and are sure to please! 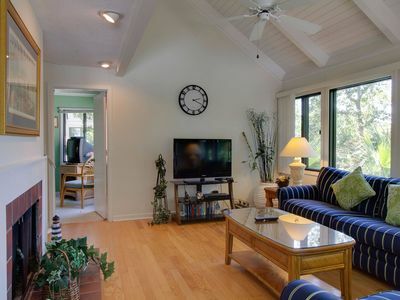 Cozy up on the King size bed and gaze out the sliding glass doors at the lush low country scenery. 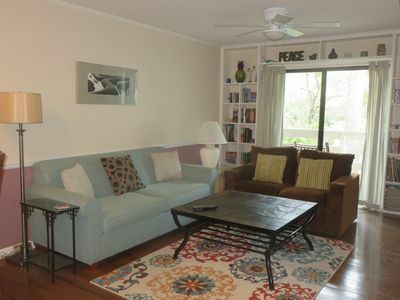 The room features private access to the back deck, TV/VCR, and private bathroom. The bathroom has a bath/shower and double sink vanity. Nautical and wicker decor with greens and blue highlights Bedroom #2's king bed. Just outside the door is a full bath with bath/shower. Bedroom #3 is classically decorated with 2 Twin Beds covered in navy and white hounds tooth print. It has a private bathroom with bath/shower. Bedroom #4 has own two sets of trundle beds decorated to be another nautical escape in blues, whites, and reds. It also has its own private bathroom. 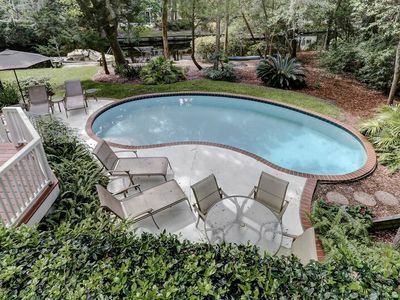 The pool can be heated for an additional cost. Please specify # of security gate passes needed at time of reservation; 1 pass per car $17/week. So what is close to you? Lawton stables offers horseback riding for the entire family, along with a feeding and petting zoo for your little people. 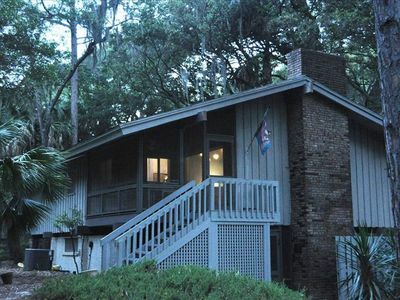 Or throw a line in over at the sea pines forest preserve! 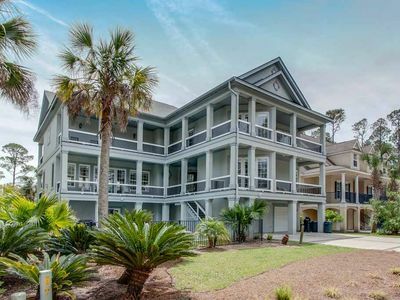 Be sure to take the 8 minute sand walk to the sea pines beach club! A Fresh catch is offered daily and the ahi tuna tacos are a must try! 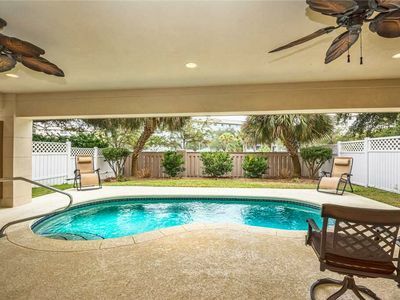 Choose to sit inside or out, upstairs or down - there is a great view from every spot! Also close is the notorious Salty Dog Cafe! Catch a local guitarist on the deck on the weekends and let the kiddos grab a souvenir t-shirt to take home! You can also catch Greg Russell in Harbor Town for seasonal shows. 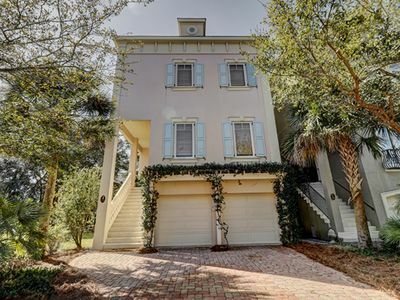 Harbor Town is also a great place for your kiddos to blow off steam - a great playground and tree house for the kids to discover! 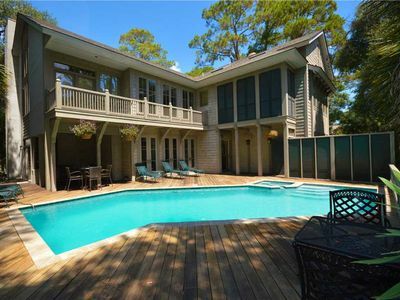 Other local favorites are Stellini's authentic Italian (one of our personal favorites), Captain Woody's (a never ending selection of sea shells for little hands to collect), the Sunrise Cafe (offers a wonderful breakfast) or for you golf fans grab a drink at the Live Oak bar located in the Plantation Club just up the street. For a great sandwich try Gruby's. Craving a margarita and fresh guacamole, try Sam Miguel's in shelter cove. Interested in an authentic pirate cruise? Catch Shannon Tanner over in Shelter Cove for tickets and seasonal shows. Shelter cove also offers weekly firework shows on Wednesdays - pop!!! Sippy cups are offered for the kiddos to limit spills. 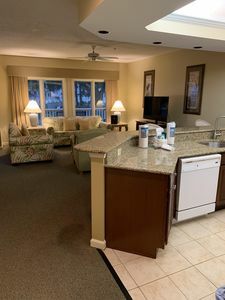 We also ask that if any damage to the property or furnishings are noticed upon your arrival to report this to our management company, Sunset Rentals, immediately. Thank you so much for sharing your vacation with us! 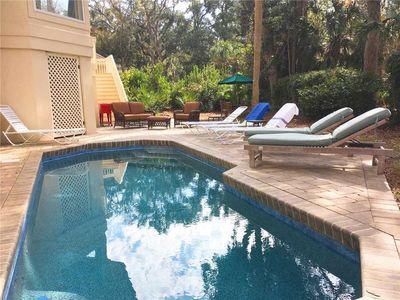 We hope you will love and care for the Hooky Daze Hacienda as your own and return for many years to come! 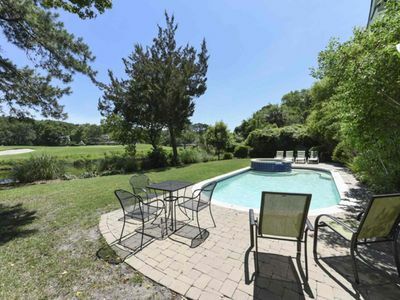 Near Ocean, Pool, Fenced Backyard,Updated, Seasonal Beach Shuttle!! 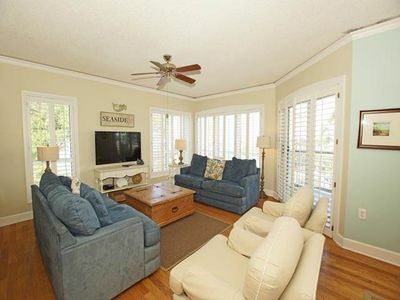 Newly Renovated Unbeatable Beachside Location in Sea Pines. 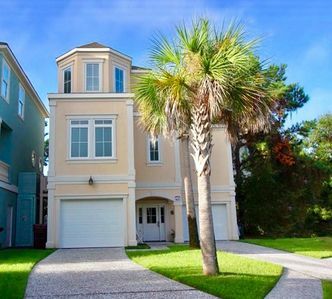 Near Ocean 5-Bedroom Hilton Head Vacation Rental! 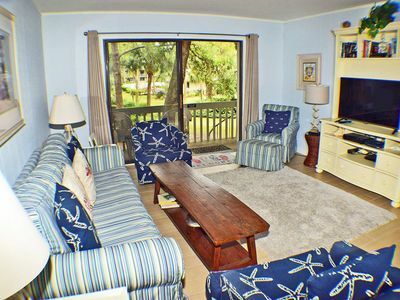 Quiet getaway with shared pool and beach access, dog-friendly attitude!